Selection of the candidate will be done directly on the basis of their performance in the qualifying examination. The applicant will be shortlisted on the basis of their performance in the Entrance Examination, Group Discussion & the Personal Interview conducted by the university. The applicant will be shortlisted on the basis of performance in the All India Engineering Entrance Examination (AIEEE) conducted by Karpagam University (KEEE). The candidate should have completed Bachelor's degree in any stream from a recognized university. Karpagam University, Coimbatore admission 2019 requires the candidate to have passed 10+2 standard or Equivalent from a recognised University with a minimum of 50% aggregate with English as a subject. Karpagam University, Coimbatore admission 2019 requires the candidate to have at least 50% marks in the 10+2 standard or Diploma in any stream. The candidates should have passed 10+2 standard or 3 year's Diploma degree or equivalent from a recognised Board. Karpagam University, Coimbatore admission 2019 requires the candidate to have passed the 10+2 standard with Maths (or) Biology / (Botany & Zoology), Physics and Chemistry as essential subjects. The candidate with Degree in Bachelor of Pharmacy should have passed 10+2 with minimum 45% marks in the aggregate. SC/ ST candidates should score at least 35% in Physics, Chemistry, Mathematics and Computer Science/ Physics, Chemistry, Mathematics and Biology/ Physics, Chemistry and Botany & Zoology. He/ She should have passed in English with at least 35% marks is mandatory for all categories for admission to the course. The candidates should have passed Diploma in Pharmacy with minimum 50% aggregate from a Pharmacy Council of India recognised Institution. Every candidate should have completed the age of 17 years as on 31st December of the year of admission. Karpagam University, Coimbatore admission 2019 requires the candidate to have passed 10+2 with Biology/ Botany/ Zoology/ Chemistry as one of the subjects from a recognized Board/University. The candidate should have passed 10+2 from a recognized board or equivalent to qualify for admission. Karpagam University, Coimbatore admission 2019 requires the candidates to have a bachelors degree in the relevant stream with an aggregate of minimum 50% marks from a recognized university. There is a relaxation of 5% aggregate marks for SC/ ST candidates. The candidate should have passed B.Arch with at least 50% marks from a recognized university. Karpagam University, Coimbatore admission 2019 requires the candidate to have passed 10+2 standard or any degree with at least Maths /Business Maths /Statistics a subject from a recognized university. The candidate should possess a Bachelors degree in any stream with Commerce/ Accountancy as a subject from a recognized University. Karpagam University, Coimbatore admission 2019 requires the candidates passing BE /B.Tech degree in the relevant stream from any recognized university. The candidates should have passed BE/ B.Tech in Civil/ Planning/ Architecture Engineering from a recognized university with at least 55% marks to be eligible for admission. The candidate should have passed B.Sc or Equivalent from a recognized university with minimum 55% marks are eligible for admission to this course. For admission the candidates to have passed 10+2 or its equivalent with at least 60% marks in Mathematics, Physics, and Chemistry. The candidates should have a passed Diploma in engineering with at least 60% marks from a recognized Board. The candidates should have passed 10+2 standard in any stream from a recognized board. Hey folks!! The students who have passed their +2 and 10th are eligible for applying for Pharm.D course. For now, colleges throughout TamilNadu have management quota for this course. General counselling is not yet available for this course. Personally, I didn't take any entrance exam. There is no specific entrance exam for Pharm.D. The cutoff mark for Pharm.D is as same as MBBS and other AHS courses. Eligibility criteria is 12th pass in science stream for getting into Karpagam University. The cut-off is also not required. the eligibility, one can join if he/she has more than 60% in HSC. Entrance exam may be conducted who are not eligible for basic needs. A simple cut off is enough. Eligibility criteria were around 50% and the admission procedures is by filling the admission form. Luckily there were no entrance exams needed. There is no entrance exam. The typical cutoff keeps changing. I got a management seat. Needed 50% cutoff marks in Physics, Chemistry and Mathematics. Applicants seeking admission should possess Master’s degree with at least 55% aggregate marks in the relevant discipline from Karpagam University or any otherUniversity recognized as equivalent thereto. Application forms can be downloaded from the university website and should be submitted upon completion, along with the processing fee of INR 750 through demand draft (DD). DD should be drawn in favor of “Karpagam University” and payable at Coimbatore. 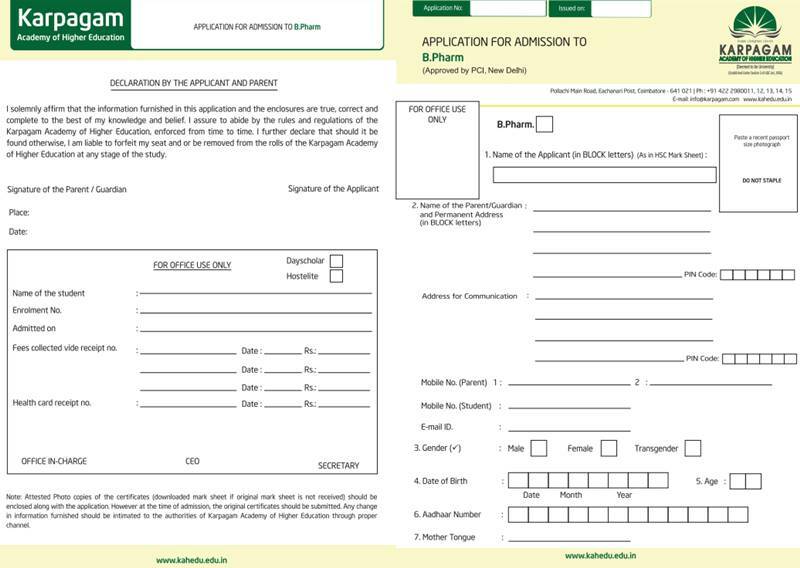 Application forms can also be obtained in person from the university office on payment of the concerned fee. Applicants seeking admission can also send the processing fee of INR 800 along with a request letter to the university and obtain the application form through post. What are the placement opportunities and average package? The university offers hostels for both the men and the women. The hostels are maintained by the wardens who are assigned by the university and the university hostel has many facilities provided for the students. The hostel has a bed and a cupboard for the residents. The hostel accommodation is given on sharing basis as per the guidelines issued by the state government. The hostel mess provides food to the students and the mess offers a variety of food to the students. The hostel is strict when it comes to discipline and any kind of indiscipline is treated severely. What's the admission procedure for BE in Karpagam University, Coimbatore? Admission to B.E / B.Tech program will be on the basis of performance in the All India Engineering Entrance Examination conducted by Karpagam University (KEEE) subject to minimum aggregate of 60% marks in Mathematics, Physics and Chemistry or Biology, Physics and Chemistry in the qualifying examination. On the basis of the merit list, Candidates will be called for counseling at Karpagam University for Final Admission. Candidates can download the application form and mail the filled in form with DD drawn in favour of Karpagam University, payable at Coimbatore.